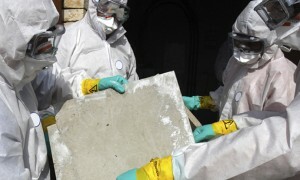 AQHI Inc. is your one-stop contractor for all kinds of asbestos removal in Rancho Cucamonga CA. In years gone by, asbestos was a very common ingredient in many different building materials. It could be found in every level of a building from the cement to the roofing. If your property was built with asbestos, it is now like a time bomb of contamination waiting to go off. In order to defuse the bomb, you need to get these materials off your property. In other words, you need professional asbestos removal in Rancho Cucamonga CA from AQHI Inc.
Why Can’t I Do My Own Asbestos Removal in Rancho Cucamonga CA? Secondly, untrained individuals can actually leave a property in worse condition than they found it after attempting an asbestos removal in Rancho Cucamonga CA. This may occur because you do not know the proper protocols for asbestos removal, containment, and cleanup, or because you do not have the skills or equipment required to implement these protocols. Considering the high stakes involved in an asbestos removal in Rancho Cucamonga CA, why would you want to risk making a mistake by attempting the job on your own? You can rely on the experts at AQHI Inc.. to handle everything for you. We complete all work to the highest possible standard including adhering to all relevant state and federal asbestos regulations. Acoustic Ceiling Removal: Removing ceiling texture takes special skill because the material cannot be wetted down to minimize fiber release, and any asbestos fibers that are released will immediately become airborne. At AQHI Inc., we know how to compensate for this with superior quality precautions such as tightly sealed work spaces and HEPA air filtration. Asbestos Roof Removal: We have actually seen general contractors throwing asbestos materials off of rooftops in blatant disregard for the requirements of proper asbestos roof removal. Needless to say, we don’t do this at AQHI Inc. We will not put your property or the environment at risk because we will follow established best practices for clean and careful removal and disposal of roofing materials. Do you think you may have asbestos-containing materials on your property? Call us AQHI Inc. at 800-481-8080 for a fair price on asbestos removal services. Our asbestos removal office for in Rancho Cucamonga CA is open Monday through Friday between 8:00 AM and 5:00 PM and closed for lunch from noon to 1:00 PM. With advance notice, projects can be scheduled for weekends, early mornings and evenings.